While the ASUS ZenBook Pro UX550VE-DB71T 15.6-inch seems to suffer from some coil whine issues and minor throttling, it still delivers an awesome performance in an attractive case, and is an excellent choice for those looking for a laptop that is suitable for both work and play. The ASUS ZenBook Pro UX550VE-DB71T 15.6-inch ultrabook has received positive reviews for its excellent build quality and aesthetically-pleasing aluminium case. Users loved its portability and its exceptionally fast performance thanks to the blazing fast 7th generation Intel i7-7700HQ Quad Core 2.8 GHz Processor that is coupled with a whopping 16GB of DDR4 RAM. It comes with a powerful Nvidia GTX 1050Ti that will allow you to run modern games as well as graphically demanding software. Furthermore, considering its powerful components, it has a decent battery life under moderate use that’ll last you the day. There were reports of coil whine however, and professional reviewers noted that the CPU and GPU combination leads to throttling of both. Some also found that there is a bit of keyboard flex. 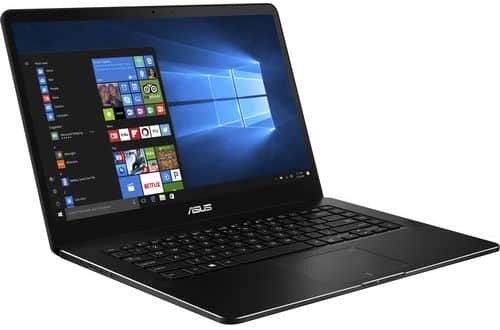 All in all, the ASUS ZenBook Pro UX550VE-DB71T 15.6-inch ultrabook is a well-priced notebook that is packed with great components and it is suitable for videographers, photographers and graphics designers, but the CPU and GPU throttling means it doesn’t quite reach its full potential. The latest Zenbook Pro features an updated GeForce GTX 1050 Ti GPU alongside the same i7-7700HQ CPU and NVMe storage (not to mention a touchscreen). How have performance, battery life, and emissions been affected by the updated configuration? The ZenBook Pro UX550VE is a sleek laptop with strong performance, but you can't get it with a 4K screen, and its speakers are too quiet. The Asus ZenBook Pro UX550VE enjoys some high-powered components and sports an elegant chassis.